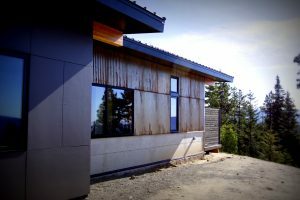 Metal vs. Composite - Finding the Right Roof for Your Home - Merle Inc. There are numerous factors to consider when selecting the perfect roof for your home. Style, cost, maintenance and longevity are all important details. Metal and composite roofs are two of the best quality products available. 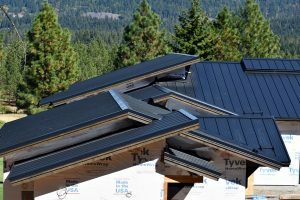 While each type has advantages and disadvantages, both metal and composite materials produce excellent roofs. The advantages of metal roofs include longevity and durability. When installed correctly, metal roofs can be a green feature of your home by improving insulation and reducing energy needed for heating and cooling. Metal roofs are fire and wind resistant and can withstand extreme weather conditions. Another factor to consider when determining if metal is right for you is snowfall. On average, Cle Elum gets 46 inches of snow per year. Metal roofs are slippery and can result in large chunks of snow falling off the roof. It’s important to consider roof-lines and pitch with proximity to entry points to avoid any chilly accidents. Snow guards can also be installed to help disperse the snow, but add additional cost. Composite roofs are made from a blend of compressed materials to create durable shingles. These types of roofs have been common on houses for many years and provide a more traditional look to the home. One advantage of a composite roof is affordability. The material itself is less expensive than metal. A well-crafted composite roof is also very durable. When properly installed, it will not crack or peel and can withstand high winds. Most manufacturers offer a 30- 50 year warranty on the product. Both material types offer high quality roofing solutions. It’s up to you to decide which fits best with your style and priorities. Discuss your options with your homebuilder and architect to ensure you make the right choice!